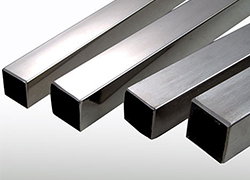 SS Square Pipes, Stainless Steel Square Pipes, SS Square Pipes Manufacturers & Exporters, SS Square Pipes Suppliers. We Royal Steel India, are one of the leading Manufacturer, Exporter & Supplier of SS Square Pipes. We hold expertise in offering a qualitative range of SS Square Pipes to our esteemed clients. Because of its longer service life, excellent usefulness and exact dimension, the demand of the offered product is widely appreciated amongst the clients'. Our offered product is bent proof and also accessible in various technical specifications in order to meet the complete fulfillment of the customers. We make it available at pocket friendly prices. Our offered SS Square Pipes is designed under the direction of adept professionals using best quality factor inputs as per the set global norms. To ensure quality assured, it is tested based on various parameters with the help of latest tools & technology. This range can also be availed by clients in various specifications as per their variegated needs.